A productive morning. My favorite kind: Doing something I want to do. 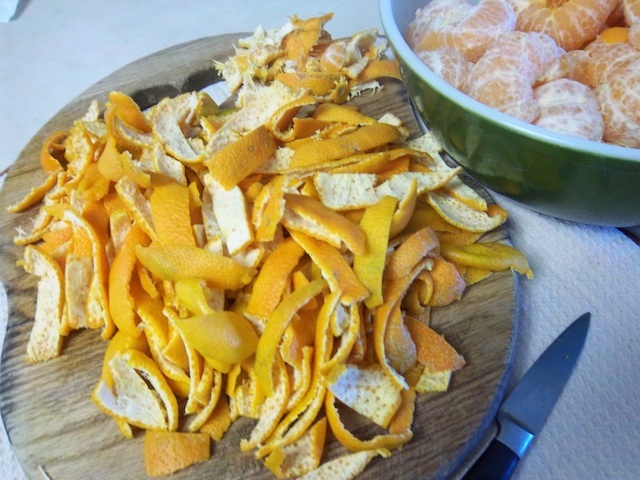 Begin with ripe tangerines, peel and remove pith. Cute little buggers, aren't they? You can use oranges or even limes but cut out thick with pith beneath skin. After a rare sleep-in (9 a.m.! ), I made sick husband an omelette and tackled a project that’s been nagging at me for a week. I had scored a huge bowl full of tangerines from my cousin’s Kane’ohe garden and, almost in the same minute, received a tiny bag of candied tangerine peel from my dear friend, Marylene Chun, complete with the recipe. Before the fruit began to go over, I HAD to find time to make these delightful and complex-flavored munchies, used by Chinese to flavor chicken soup and other chicken dishes as well as just to enjoy with tea. 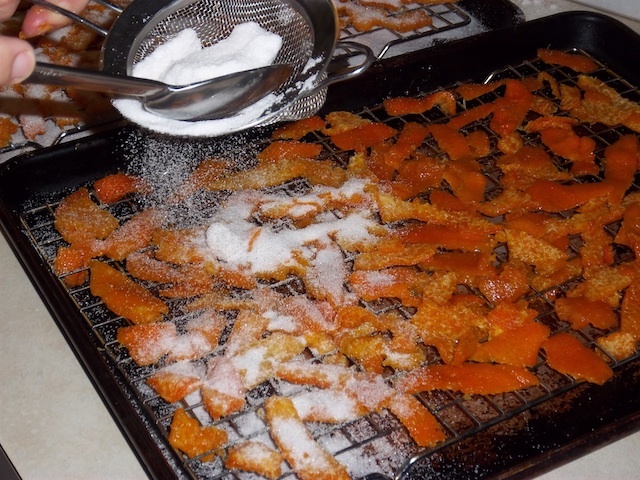 As with so many old-timey recipes, candied peel is not difficult, just a bit tedious. First, count your fruit; you’ll need the number later, the minimum for this recipe is six ripe, unblemished fruit. (A little green blush is fine.) I soon got quite good at reaping the peel in large pieces, ready to cut. Hold the fruit in the palm of your hand, stem side down. There’s a little depression at the center; curl your thumb around and dig into that until it breaks. Then use your other hand to neatly tear the peel into five petals curving out from the fruit.Pretty. 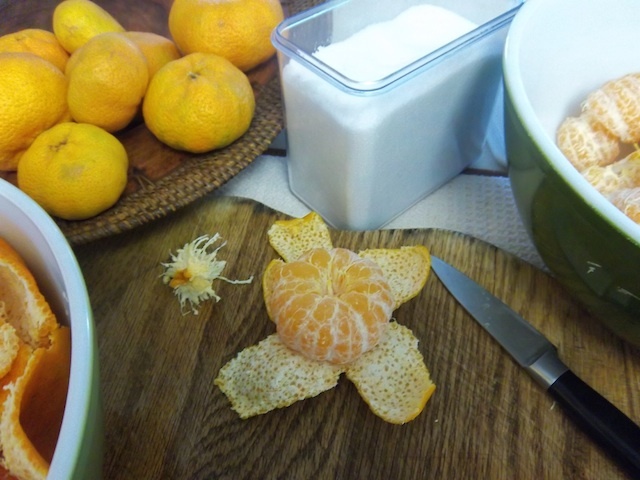 Pull the segments out, cut away the little pith and the hard stem. Cut the peel into strips about 1/2 inch wide and 2 inches long (neatness not a requirement). A mess o' tangerine peel. Thanks, cuz! Place a rimmed baking sheet on the counter and line with a rack (such as you cool baked goods on). Finally, for every six fruit, place 1 cup water and 1 cup granulated sugar in a soup pot. Bring to a boil. Lower heat to a high simmer and cook 15 minutes. Drain. Place a bunch of sugar in a deep bowl and spoon in peels a cup or two at a time, roll in sugar. 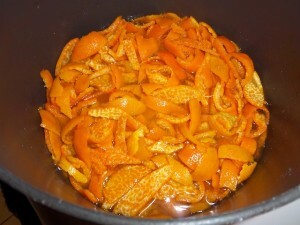 Cooking the tangerine peel; no need to drown it; stir every so often. Arrange the strips of fruit on the rack; this needn’t be a perfect, lined-up regiment but try not to pile them on top of each other. Allow to season for a day. Recoat a second time; (I used a sieve full of sugar, then turned the pieces around). Dry for a second day. Store in an airtight container or zippered plastic bag. Or freeze. If you’ve got ants as creative as determined as my tribe, definitely freeze. Sugaring tangerine. The sugar will be absorbed into the peel as you dry it; this takes two days. You always have a recipe I want to try. Loved your photos. Your images are lolvey, and you are so right about tangarines! I had a tangerine this morning with my girls we LOVE them. I think we could eat them all day! We have oil of sweet orange, and it is so nice. I dribble a drop on a lamp, and mix it in with my cleaner for a wonderful happy fresh feeling in the house! Also, when mixed with a smidge of clove oil the scent turns so warm and inviting and very Christmasy. Okay, sorry for the ramble!I also am in love with the image in your holiday header. Those bulbs are so shiny and nice!